Two veterans of the Normandy landings have been reunited for the first time in 67 years following a chance meeting on return journey to France funded by the Heroes Return 2 programme. 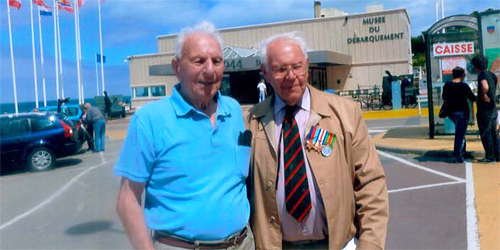 Bill Betts, 88, and Clifford Baker, 98, landed on Gold Beach on D-Day, 6 June 1944, but would not see each other again until their paths crossed at Arromanches war museum earlier this year. The pair received separate grants for their poignant trips and had never expected to meet each other after all these years. The last time they’d been together was in the relative safety of sand dunes as German mortars screamed overhead. Mr Betts had been injured by enemy fire and was told by his captain to stay put while Mr Baker and the rest of the Essex Yeomanry continued their assault further up the beach. Warwick-based veteran, Bill Betts, 88, joined the Essex Yeomanry at the age of 19 in December 1941 – training for over two years as a radio operator in preparation for the D-Day Landings. When the day of invasion arrived, Bill and his comrades boarded landing craft in Poole, Dorset, before linking up with other regiments further down the coast in Southampton. From there they began the perilous push across the Channel towards the Normandy beaches where many men would sadly lose their lives. He recalls: “I suffered terrible sea-sickness on that rough crossing which luckily took my mind off what was lay in store for us. As a radio operator on one of the craft, I was responsible for checking map references so the shells we fired on the beaches from three to four miles out at sea hit their intended targets and not our own boys. It was quite a responsibility for a lad my age. “When we made it to Gold Beach and left the landing craft with bullets and bombs exploding around us, we followed a tape marking a safe route past land mines buried beneath the sand. I made it as far as some dunes a bit further up but then felt a searing pain in my right leg – I’d been shot and could go no further. Bill had been signing the leather-bound book of remembrance at Arromanches D-Day Museum when he spotted Clifford’s handwritten entry directly above his. “I couldn’t believe my eyes when I saw his name and a mention of the Essex Yeomanry in the book, but there it was in black and white. I’d been given a commemorative medal by the Mayor of Arromanches so asked her just when Mr. Baker had been into the museum that day. When she said only twenty minutes before and that his coach to Port Talbot was now boarding in the car park, I decided that I had to take the chance to catch him. “The lady mayor ran off and thankfully managed to halt his coach before it left,” he continues. “After 67 years we were face to face again so you can imagine just how emotional that was. We had a chat about D-Day and the events that happened such a long time ago. The memories of it all are still very clear in my mind. After recovering from his war wounds back on home soil, Bill rejoined the Essex Yeomanry in France. He fought on with them through Belgium, the Netherlands and into Germany. Surviving countless skirmishes with the enemy and some of the coldest winter weather on record, Bill was finally demobbed in December 1946 and in later years enjoyed a successful career in the motor industry which allowed him to travel across the world once again.